Spider veins on legs are common and sometimes unsightly. Many people notice these progressive broken blood vessels on their thighs and calves. Certain factors like genetics, pregnancy, and prolonged standing can lead to the development of spider veins. 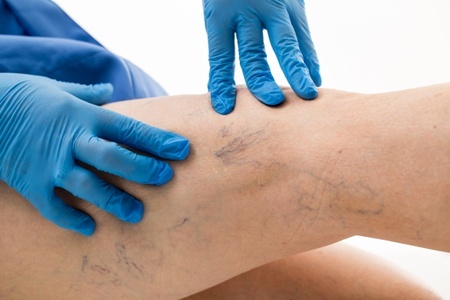 Fortunately, spider veins don’t need to be a permanent condition. With sclerotherapy and laser vein treatment, experienced dermatologist Dr. Gabriele Weichert can help diminish the appearance of unsightly veins and help you feel more comfortable wearing leg-exposing clothing and swimsuits. If you live in Nanaimo or other community on Central Vancouver Island and would like to learn more about the spider vein treatments offered at Synergy Medical Aesthetics, please contact us today online or at 250-591-1566 to schedule a consultation with Dr. Weichert. Sclerotherapy is a non-surgical treatment designed to improve the appearance of spider veins on the legs. During your procedure, concentrated sugar/salt solution (Sclerodex) is injected with a very small needle into the affected veins. This injection improves the appearance of spider veins by causing microscopic irritation and vein closure. One treatment can often provide 50 to 60 percent improvement. A second treatment can offer added benefit. Sclerotherapy is relatively painless and very well tolerated. Side effects can include mild bruising and discolouration for a few weeks. Fall/Winter is the preferred season for treatment since legs are covered for a few months. Post-treatment compression stocking are highly recommended. Laser light of specific wavelengths (1064 nm being the most effective for improving the appearance of veins in the leg) can selectively seal targeted blood vessels without harming your surrounding skin. Laser treatment is effective for addressing unwanted veins that are too narrow for a sclerotherapy needle to successfully enter. Laser vessels treatment is also used for facial blood vessels which are not treated with injection for safety reasons. During your consultation, Dr. Weichert will fully asses your condition and recommend a treatment plan that is customized to meet your specific needs and goals. Limited areas of treatment start at $175 per session. Costs vary based on amount of area treated. More than one session may be required. Spider veins are the small veins that branch off of a main root vein. They can appear in the face, chest, arms and legs. Spider veins are unsightly, unnecessary and can often cause self-consciousness and embarrassment. Unlike normal veins, they can easily be seen through the skin as they twist and turn in a variety of colours, most often blue, red or purple. Spider veins occur more often in women than in men, affecting between 30 and 60 percent of the population. Although they can affect younger people, spider veins appear most often among older women and men. The first step to improving the appearance of your spider veins is to schedule a sclerotherapy consultation with Dr. Weichert. During this personal meeting, Dr. Weichert will assess your spider veins and discuss your personal aesthetic goals. She will thoroughly explain your condition and all of your treatment options. Sclerotherapy treatment appointments vary between 15 and 45 minutes. Your treatment will typically not be performed on the day of consultation. After your initial assessment, your treatment can be offered within a few weeks. Compression stockings will be recommended to be purchased PRIOR to sclerotherapy for maximized outcomes. How Much Does Sclerotherapy and Laser Vein Treatment Cost? No two people or conditions are exactly the same, and the cost of spider vein treatment can vary from patient to patient. The cost estimate for your individually customized sclerotherapy treatment and/or laser vein treatment will be provided during your consultation visit with Dr. Weichert. At Synergy Medical Aesthetics, the sclerotherapy procedure typically ranges from $300 to $400 per treatment. Basic laser vein treatments start at $175 per session. If you suffer from spider veins and would like to discuss your treatment options with experienced dermatologist Dr. Gabriele Weichert, please call 250-591-1566 today to schedule your sclerotherapy consultation and assessment. Our office is located in Nanaimo and we proudly welcome patients from throughout Central Vancouver Island.